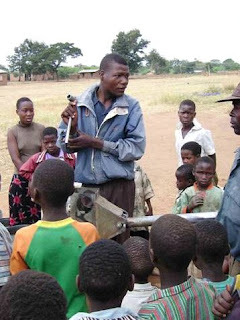 Area mechanics (AM) are identified with help of the District and the communities, then trained CBM1 (Community Based Management Level 1) & CBM2 on Afridev. Tools kits and Push bike provided when they sign a 2 years contract in which they engage themselves to be active in their catchment’s area and attend monthly meeting s organized by the project. They have to work as independent workers and get labour charges from the communities. At the beginning of the project, they get technical supports and tips on community social approach from InterAide Maintenance assistants (one is present in each district and is mobile with a motorcycle). During the monthly meetings, they report on the contracts signed, get in touch with the maintenance project and share experience with others AM. The reparation contract to repair a broken hand pump. Cost between 500 Mk and 1.200 Mk. The contract has a guarantee of one month. The maintenance contract only deals with functional hand pump for preventive maintenance (4 visits per year). Cost around 1.200 Mk.